FMB: Get your sunglasses/bandana. Buy your costume. FMB members can see me sometime today to get your sunglasses and bandana. They are a gift from me to you for a successful season. If you are interested in keeping your costume, please make a donation of $10 for shirts or $20 for flight suits. You may pay in cash or make a check payable to Fairbanks Band. After all percussion and sousaphones have had an opportunity to buy their own outfit, flight suits will be sold on a first-come basis. BTW...they make GREAT Halloween costumes! Dress is full uniform. Music is senior show. Come prepared to stay warm! *Wittenburg University will hold music scholarship auditions January 21, February 5, 14, 21, and March 18. More information is available at www.wittenberg.edu/music. *Otterbein University will hold an audition workshop for juniors and seniors who are interested in auditioning for college/university music programs on Saturday, December 11. Please rsvp to cbrock@otterbein.edu or by calling 614.823.1504. FMB: Pics from Senior Show Are Posted! 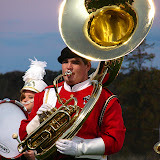 The Fairbanks Marching Band will make its annual appearance at the Milford Center Holiday parade on Sunday, November 28. We will warm up at 12:15pm at the old elementary school in Milford. The parade will begin at 1pm and we will be done by 1:30. Dress is full uniform. You will need to memorize a short holiday parade tune, which will be handed out next week. I promise it will not challenge you. Please mark your calendars and plan on attending. If you have an unavoidable conflict, please contact me as soon as possible. 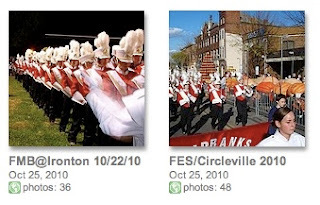 Pictures from Miami Trace, Fairbanks Homecoming, and Teays Valley are on the picture page. Senior night pics will be up soon...they are on my other camera. I have been informed by the athletic department that there is a very good chance of the FHS football team making the playoffs this season. If they do qualify, they will play an away game on Saturday, November 6. The site of the game depends on the final computer points tally which is not released until Monday, November 1. The FMB will attend the game (if the team qualifies) and support the "men who wear the 'F' ". Please reserve the November 6 date on your calendar. If you have any pre-existing conflicts with this date, please contact me as soon as possible. 1:30 pm - Members excused from class. Dress is full uniform. We will perform music from both contest and senior show. Bach Stradavarius Trumpet Sale at Rettig Music! FHSCB Audition Info: Auditions begin 10/25. Rehearsals Begin 11/1. Seating audition information will be distributed on Monday, October 18. All FHCB members need to come to the band room at 2:10 on this day to receive audition information, prepared music, scale sheets, and to sign up for an audition time. All FHSCB members must report each day to the band room during seventh period beginning on Monday, October 25, which is the first day of the second grading period. Auditions will take place the week of October 25 during seventh period and on two days after school (tentatively on Monday 10/25 and Wednesday 10/27). All band members must sign up for an audition time. Members will not be seated nor receive credit for the class if they do not complete a seating audition. Bring spending money for concession stand food if you wish. Do your best. Have fun. Make music. Play the phrase! The Fairbanks Marching Band give its annual performances at Fairbanks Elementary School and the Circleville Pumpkin Show on Thursday, October 21. Band Members will need to be in full uniform for both events so please bring black socks and Drillmasters. Immediately after attendance in home room, band members need to report to the band room to prepare for the concert at the elementary which will begin at 9am. We will perform music from pre-game, contest, and senior shows as well as some cheers. We will depart for Circleville around 10am and will return to FHS at 7pm. Band members will have some free time at the show and will need spending money for lunch and dinner. There are also games and rides, so bring an amount of money for your particular spending habits. If you haven't heard already, we received a letter from OSU on October 6 telling us that our application to the OSU Invitational had not been accepted. I have received apologies from the OSU Band Department as well as OMEA, but the fact remains, that we, and MANY other bands were turned away as over 80 groups applied for 28 spots. We were in a smaller group, however, that was notified VERY late about our situation. I have expressed my displeasure with this miscommunication to both OSU and OMEA, but the situation remains. There is nothing we can do at this point to get into the OSU contest...they are full. So, we must put this behind us. 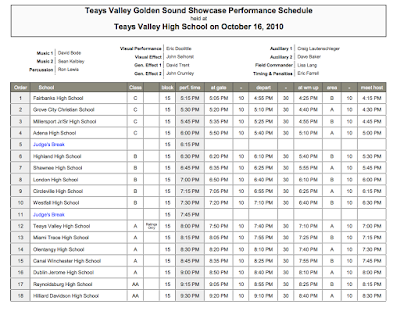 Just in: We will be attending the Teays Valley contest on October 16. We perform at 5:15pm. Details will be coming very soon. Hooray! I have just been notified by Mr. Montgomery that there is no varsity football game this Friday or Saturday. Enjoy your weekend off! Next week is the senior show on October 15 and our final contest on October 16 at Ohio State. Our trip to Ironton is on October 22. Also coming up soon is our annual pilgrimage to FES and the Circleville Pumpkin Show on October 21. Details on all of these events will be forthcoming very soon! I just got word from the administration that the Fostoria St. Wendelein team is kaput and there will be no football game this Saturday. You have the entire weekend off! This means, however, that we will be making the trip to Ironton on Friday, October 22. We will depart FHS at approximately 2pm and return around 1am. This game has been on the calendar since Spring, so it is a required event. Dress will be full uniform. More details will be forthcoming as plans are made for the Ironton trip. There is a possibility that we may be able to procure a charter bus for this trip to make the journey easier for everyone. We hope to be able to afford this from booster funds, but may have to ask for a small fee (less than $10 per member) to actually make this happen. Enjoy your very rare and cherished weekend off!